My great-grandparents, Andrew and Christine Quaal were among the first settlers in Forbes, Minnesota in 1893. They were farmers, owned the general store and raised six children. Christine was also the local midwife and helped the immigrants with their English. I like to call her the original Minnesota Farm Woman. When telephone service came to the area about 1915, I’m sure there was plenty of excitement throughout the small farming community. Telephones would open up their little corner of northern Minnesota to the world. 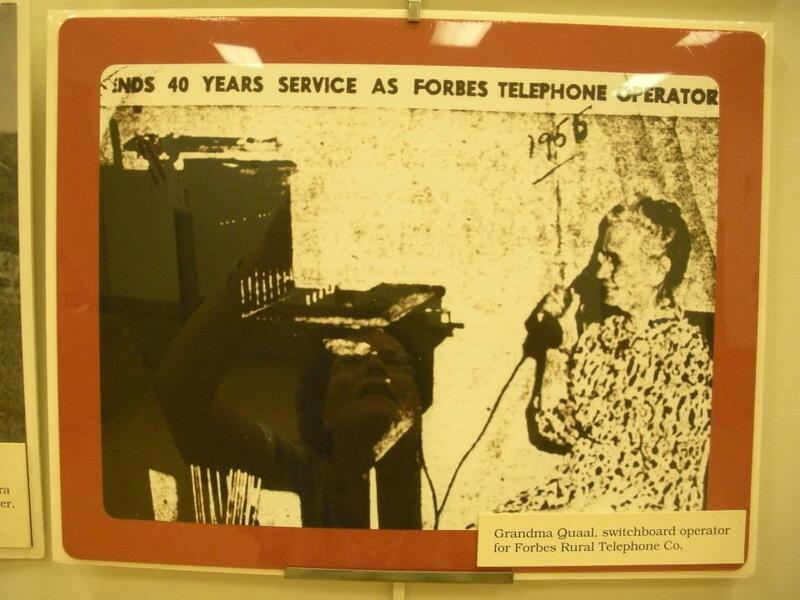 Grandma and Grandpa were instrumental in getting the service to Forbes, and kept the switchboard in their home. Those of us who carry cell phones in our back pockets and purses perhaps don’t understand just how a telephone switchboard works, so let me see if I can explain it: Ole wants to call Lena. In order to do this, Ole must turn the crank on his telephone, which rings into Grandma’s house. Ole tells Grandma that he wants to talk to Lena, and Grandma plugs the wire into the jack, flipping a switch to make the connection. Being an operator would mean that Grandma must not have left the house very often, because someone always had to be there for the calls to go through. Since she ran the switchboard for 40 years, she must have liked her job, too. Grandma did manage to have a social life, however. She had people come in to watch the switchboard when she went to church, Lutheran Ladies’ Aid meetings, or funerals. Plenty of folks came to visit her at the farm for coffee and cookies and probably a little old-fashioned gossip. Grandma had the coffee pot going on the stove all the time, the good strong Scandinavian-type of coffee that can warm the belly on the coldest winter day and probably put hair on your chest if you drink more than two cups. Family lore has it that the coffee grounds weren’t changed all that often, but when they were, the used grounds were spread around the rose bushes along with buttermilk left over from the churning. Those two ingredients were the secret to the prettiest flowers around, according to my father. The part about the gossip is something I made up, though. Grandpa died in 1929 and Grandma died in 1966 when she was 93 and I was eight, so I don’t remember a lot about her. I was recently stopped by someone who recognized Grandma’s picture, which is the same old photograph that I use for The Minnesota Farm Woman column in the paper and on my web site. She recognized Christine as the lady that everyone in Forbes called “Grandma Quaal” and had a story that her own grandmother told her: My great-grandmother, pillar of society, midwife, business owner and churchgoer would listen in on everyone’s telephone conversations! How did they know for sure? Grandma had a cuckoo clock which rang on the quarter-hour, and that gave away her secret. We all had a good laugh over that one, but I tend to stick up for Grandma, since I was named for her. What harm is listening in along with a little strong coffee and mild gossip to pass the time during the long Minnesota winters? I watch Desperate Housewives myself so perhaps Grandma came up with her own version, Forbes Farmwives. A little Farm Woman advice is always forthcoming, though. 1) Don’t switch to mild coffee and strong gossip, as neither one is worth the trouble. 2) Never ask for a third cup of that Scandinavian brew or you really might grow hair on your chest. 3) Between you, me, and the cuckoo clock, watch what you say because you just never know who might be listening. After the Forbes Rural Telephone Company was dissolved, the switchboard was sent to the Minnesota Historical Society in St. Paul. It isn’t on display anymore, so it is probably in an attic somewhere, gathering dust.